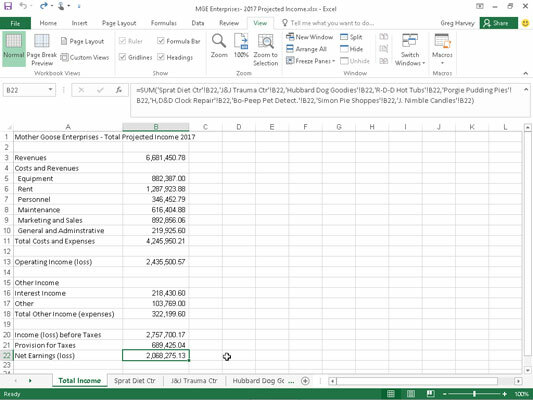 You can create a summary worksheet in Excel 2016 that recaps or totals the values stored in a bunch of other worksheets in the workbook. Here you create a summary worksheet titled Total Projected Income for the MGE – 2017 Projected Income workbook. This summary worksheet totals the projected revenue and expenses for all the companies that Mother Goose Enterprises operates. 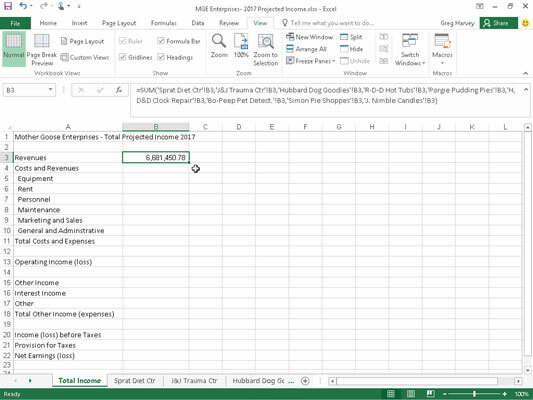 A new worksheet is inserted in front of the other worksheets in the MGE – 2017 Projected Income workbook and rename its sheet tab from Sheet1 to Total Income. Next, enter the worksheet title Mother Goose Enterprises – Total Projected Income 2017 in cell A1. The Formula bar reads =SUM(‘Sprat Diet Ctr‘!B3) after selecting this cell. The Formula bar now reads =SUM(‘Sprat Diet Ctr‘!B3,‘J&J Trauma Ctr‘!B3) after you select this cell. At the end of this procedure, the Formula bar now appears with the whopping SUM formula shown on the Formula bar in the figure. To complete the SUM formula in cell B3 of the Total Income worksheet, click the Enter box in the Formula bar (youI could press Enter on your keyboard, as well). In the figure, note the result in cell B3. As you can see in the Formula bar, the master SUM formula that returns 6,681,450.78 to cell B3 of the Total Income worksheet gets its result by summing the values in B3 in all nine of the supporting worksheets. The Total Income worksheet after I create a SUM formula to total projected revenues for all the Mother Goose companies. In this figure, you see the first section of the summary Total Income worksheet after you copy the formula created in cell B3 and after you delete the formulas from the cells that should be blank (all those that came up 0 in column B). The Total Income worksheet after I copy the SUM formula and delete formulas that return zero values.